Straight ouzo doesn’t have that many fans—too harsh, too sweet. 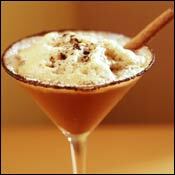 But mix the licorice liqueur into a coffee frappé, and it mellows into something frosty, creamy, and entirely well-balanced. This drink comes from executive chef Jim Botsacos of Molyvos. Call it a Big Fat Greek Cocktail. Combine the ouzo, coffee liqueur, instant coffee, and milk in a cocktail shaker, and fill with ice. Shake vigorously, and pour into a rocks glass or strain into a glass without ice. Garnish with the coffee-and-brown-sugar mixture and the cinnamon stick.